Offshore Killer Whales are rarely seen along the coastline off Northern Vancouver Island, British Columbia. A chance to get a photo of Offshore Killer Whales off Northern Vancouver Island in British Columbia, Canada is very far and few between especially at a distance this close to town. This pod of offshore whales looks fairly similar to the resident and transient killer whales except there are very subtle differences in their dorsal fins and their socialization. Offshore Killer Whales are not very well identified as they are not spotted on a regular occurrence like the resident killer whales. When they are seen, whale enthusiasts, locals and fisherman try to capture as many pictures as possible to see if they can be recognized or if it is a whole new pod passing through. There has been over two hundred offshore whales identified but there is still not a great deal of knowledge about them or exactly how many exist. The Offshore Killer Whales usually travel in groups of 30 to 60 and have been seen most often either chasing a school or fish or eating one. 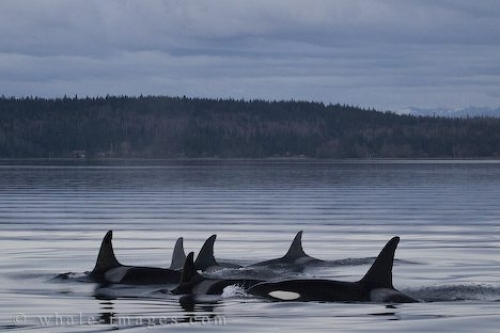 Most encounters with the Offshore Killer Whales have been near the Queen Charlotte Islands, miles off the west coast off Vancouver Island and in areas along the Pacific coast from Southern California and Alaska. While out on the waters off Northern Vancouver Island in British Columbia, Canada always have your camera with you as you never know when a group of Offshore Killer Whales will pass by. The more pictures that can be collected of this type of killer whale, the more we will learn about the mighty black and white sea mammal.